Successfully Added U.S. Plug Portable Video Projector Wireless Projector Multimedia HD1080P Cinema Theater Projector with HDMI/VGA/AV/USB/RJ45-LAN to your Shopping Cart. ViviBright SimpleBeamer GP90 projector brings HD 1280x800 native resolutions with images up to 200 inches for the ultimate home movie projector experience. This 3200 lumen HD projector is fantastic value for money coming in at just $130 and while best used in a dark room the projected image is still visible when used with the lights on. Having two HDMI inputs means you won't have to keep getting up to reconnect different source devices each time you want to switch from watching movies to playing games or surfing the web on your computer. There are also VGA, AV, and USB as well as a speaker out jack to give you that full movie theater experience. Supporting front, rear, and ceiling projection modes this versatile LRD projector is great for use in your home, classroom or meeting room. A 15-degree keystone correction lets you adjust the image if the projector is placed on an angled surface. Helping you control the projector from any location are front and rear IR blasters so it's easy to control via the included remote. With the superb color range and a 3000 to 1 contrast ratio, you'll be presented with lush clear images that really pop to life. Running on a mains power supply the built-in fan prevents any overheating and with a LED light bulb life of around 20,000 hours, this quality projector will bring years of entertainment for you and the family. 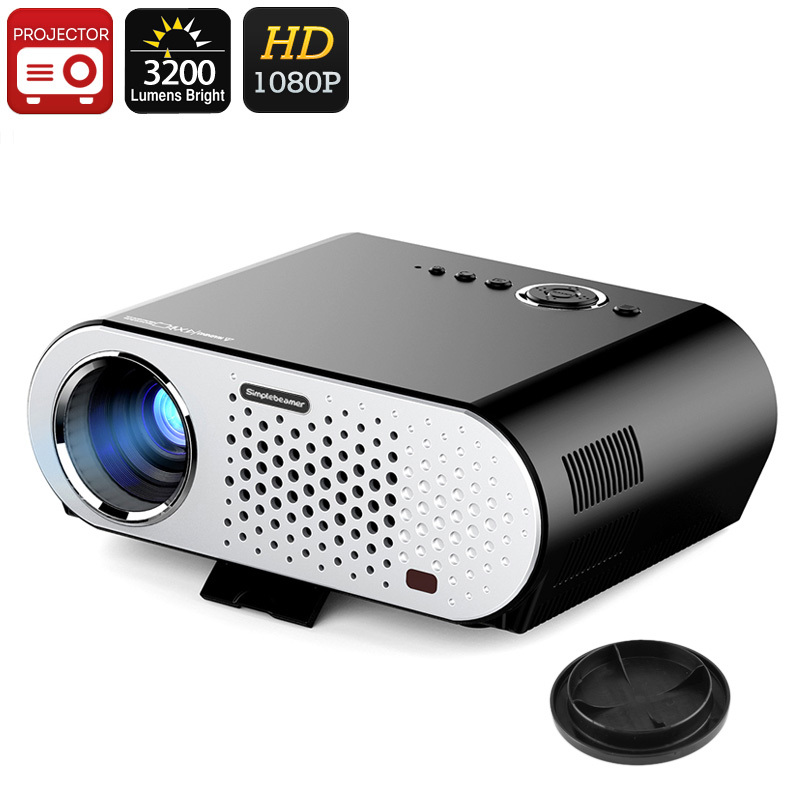 The ViviBright SimpleBeamer GP90 projector comes with 12 months warranty, brought to you by the leader in electronic devices as well as wholesale LED projectors and home movie systems.. Delivery was fast. The picture quality is awesome even in daylight. The sound quality is good for my space. I really didn't need to buy a speaker. Works incredibly well with my TV box. The fan noise isn't a problem.